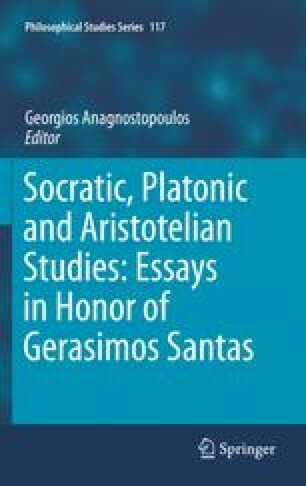 Gerasimos Santas has devoted his career to displaying that in order at once to clarify the content of Plato’s dialogues, and to realize Plato’s purpose in writing them, we must do philosophy ourselves. We have to play the roles both of handmaiden, attending to all the details of the text, and of apprentice, not leaving the philosophy to Plato but joining in the argument. Santas sets us an example of clarity of thought, lucidity of expression, and—to convey a positive quality negatively—lack of egocentricity to set beside that of Gregory Vlastos. If Plato intends his reader to share his own risks, the constructive interpreter must take on the perils of constructive philosophy. What his readers can reasonably expect is not that he play safe, but that he refresh their own reading of Plato. As a sample of such enlivening, I here offer a response to Santas (2006). This invites our attention as bringing equally to life points in the text that do fit it, and points that appear not to.